Are you vexed by inability to play new DVD movies on Motorola Droid RAZR HD? Have you ever wondered to convert DVD to Droid RAZR HD for playback? Before getting the right answer, let's have a look at the features making RAZR HD fantastic for DVD playback. Of course, when referring to Motorola Droid RAZR HD, the first thing coming into our mind may be its excellent display. Armed with 4.7-inch screen with the high screen resolution of 720×1280 pixels, Droid RAZR HD offers users an amazing visual experience. Delightfully, its long battery life also ensures you to watch videos and movies without being bothered by frequent charging. Unfortunately, none mobile phones build in a DVD driver, and Droid RAZR HD is no exception, which is impossible to import DVDs to RAZR HD for entertainment. In this case, it is necessary to find a tool to convert DVD to Droid RAZR HD mobile friendly format for playback. As a matter of fact, a DVD converter may help you out , but with so many DVDs nowadays come with copy protection put in place by publishers, it's not an easy task to reach this goal. So the best DVD ripping tool can not only decrypt DVD but also convert DVD to a video format playable on Droid RAZR HD. Well, MacX DVD Ripper Pro offers a perfect solution to convert DVD to Droid RAZR HD on Mac without worrying about the copy protections on DVD, so that you can import DVD movies to Motorola Droid RAZR HD for enjoyment anywhere anytime. Free download the world's fastest DVD ripper and rip DVD including the latest encrypted DVD movies to Motorola Droid RAZR HD with original high quality kept. Below is the step-by-step guide on how to convert DVD to Droid RAZR HD on Mac for playback on the move. Firstly, you need to download, install and run this DVD ripper for Mac. Then, hit "DVD Disc" button to finish the DVD source importation. Alternatively, you can import this disc by hitting "DVD Path". After finish loading the DVD, you can go to "Output Profile" drop-down box to pick up Motorola Droid RAZR HD accepted format as the output format, say H264/MPEG4. 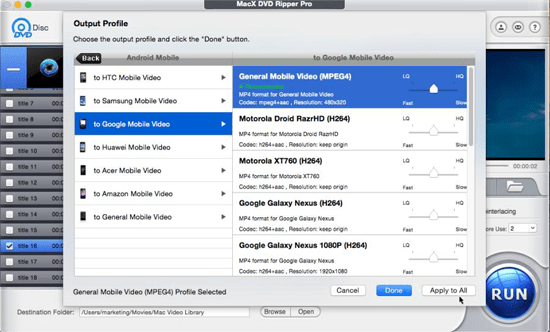 This DVD ripper also offers output profiles for other Google Mobiles like Google Galaxy Nexus. So you can feel free to rip DVD to Google Galaxy Nexus 5 on Mac. Tips: To better your top Hollywood movies enjoyment before DVD to Motorola Droid RAZR HD conversion on Mac, you can click "edit" button in the main interface of the Mac DVD to Droid RAZR HD ripper, you can trim off the unwanted part, combine several clips into one file, crop off unwanted black bars of the DVD movie, etc. Click bottom-right "RUN" and start to rip and convert DVD to Droid RAZR HD recognized video on Mac. When everything is done, you can import the ripped DVD movies to Droid RAZR HD via USB for infinite playback. And if you wanna watch movies on iOS devices, you can use MacX MediaTrans to transfer the converted DVD video from computer to iPhone iPad iPod for playback without limits. Notice: We only advocate using this best DVD ripper to rip commercial DVDs to Motorola Droid RAZR HD under the concept of Fair Use and do not encourage any illegal reproduction or distribution of copyrighted content. Please abide by the local DVD copyright law before doing it.